You can add a wrapped noseband, or extra noseband knots to your halter. 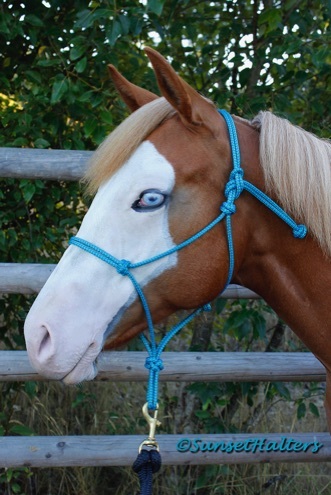 Gunnar's shown here wearing a medium pony 1/4" diamond braid rope halter, in the kelly/pacific color. This size is great for younger/refined yearlings as well. 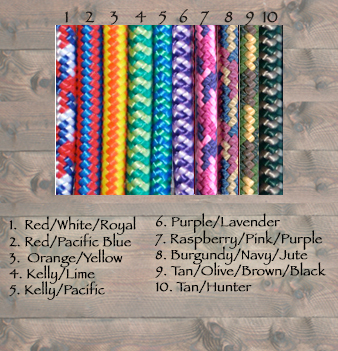 The 5/8" derby lead rope's (sold separately) are made with the same fiber for a great matching set. We use a fiador knot at the chin, our special throat latch knot, and lovers knots throughout. The ends are also finished with lover's knots. This rope has been custom made for us here in the U.S.A., not China. Tons of great custom color combos, you'll only find here! These are great light weight halters you can easily stuff in your pocket, or put on under a bridle. Mildew, and rot resistant. Available in the colors shown below. You choose from our 9 main sizes. Starting at $13.50. Custom sizes are available at no extra cost.